I'm a teacher (Referal ID is diana.arbol) but I don't know how to enter Genopro as such, because normally I use the TMP key that you send me. Now it expired 2 hours ago while working and I don't know how to get a new one, or even better, how to use my Referral ID to enter without the need of a key. Anyway a student is asking me for a key and he is having troubles getting it because my old one just expired. In the forum or in the tutorials I don't find this information clear enough, thank you! Your students can still get new free 6 months registration key using your current referral code. This works completely independent of your "personal" key. Your referal code is valid forever; no need to re-apply. 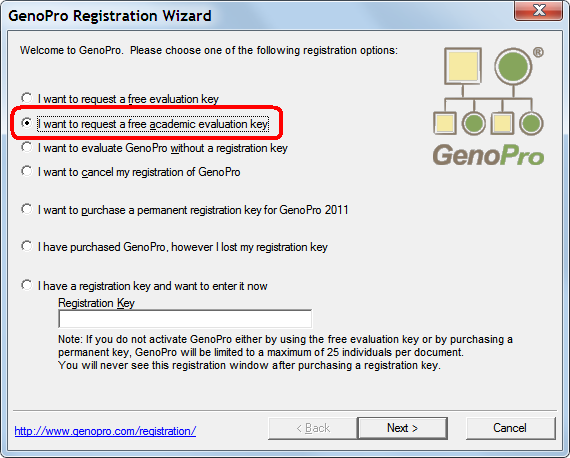 As for yourself or returning student that have expired key, they should consider purchasing GenoPro. It's a one time purchase (no fee per year or month). If you follow this link you will get a 25% rebate. Hi, can you please tell me how to get my "personal" key? I still didn't understand how it works. I always use the student key that expires every 6 months. When GenoPro starts, enter your key starting with 3-V6N7 and you will never see this message again. I have a referral id, where does this get inputted?